Alex Morgan has fast become the closer for the U.S. women's national soccer team. MANHATTAN BEACH, Calif. -- The youngest player on the U.S. roster for the upcoming Women's World Cup could turn out to be the most vital. Think of Alex Morgan, just 21, as the Americans' closer: When they need some late offense, it's her they turn to. The slashing striker from Diamond Bar has enjoyed a meteoric rise with the U.S. women's national team over the last year and a half, but the seeds were planted well before she was born -- in Mike and Pam Morgan's desperation for a son -- and found roots one thrilling afternoon at Home Depot Center. Alex Morgan didn't get serious about soccer until well after most girls who reach national-team levels do. It has led her to Germany, where she'll play an important role as the U.S. seeks its third Women's World Cup crown, and first since the magical summer of '99, starting Tuesday, when the Yanks open group play against North Korea in Dresden. She's one of three local products on the U.S. roster -- Redondo Beach's Shannon Boxx is the midfield anchor, Lake Forest's Amy Rodriguez a starting forward -- and the one coach Pia Sundhage will look to as time runs down in the tightest of encounters. Since Morgan made her international debut, at the end of March 2010, she has scored seven goals in 19 appearances, including a stoppage-time winner in Italy that got the U.S. into its sixth WWC. Four of her strikes have come later than the 80th minute, and her scoring rate -- one goal roughly every 84 minutes -- is tops on the team. Her game is about flash and power, forged in competition and drills run by her father well before the notion of playing soccer at the top level surfaced, and it has everything, or nearly everything, to do with her parents' desire that their third child be a son. "I was supposed to be a boy. Alexander," Morgan says. "And I was a girl. Alexandra. And my dad said, 'Well, you're staying in sports, because you're my boy.' ... It worked out." Her father said the plan was to have two children, "and after the second daughter, what do we do? If we try to have another child, we've got to make sure this is a son. "We did everything upside down, inside-out, wait for special days in the calendar, this and that -- but we still had another girl. Not that that's a bad thing. After that one, I said that's it, three girls is enough." He raised them to be ultracompetitive, and little Alex battled her best against Jenny, now 27, and Jeri, 25. "They never cut any slack," Mike Morgan says. "That's the way I raised them. We play a simple game, a board game, whatever, and we play to win." Alex played every sport she could growing up, focusing first on softball -- the sport her sisters played, that her father guided her toward -- and then adding soccer, volleyball, basketball and track and field to the calendar. 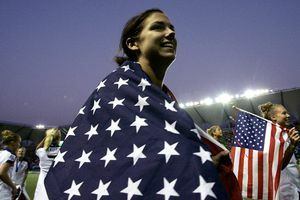 Soccer won out because Morgan preferred to run more than softball allowed and through the influence of the celebrated women who charmed America in that magical summer of '99. Morgan turned 10 that year -- she'll be 22 on July 2 -- and was enthralled. "The 'Fab Five' and Mia Hamm and all them -- I really looked up to them and watched them a lot," she says. "After that, I started looking into soccer more, because this was still when I was playing all those different sports, but I was following soccer especially. "But then I went to Mia Hamm and Joy Fawcett and Julie Foudy's retirement game [at HDC] in '04, and that's when I really started to focus on soccer." Before that, soccer was "an AYSO thing that she did during the offseason" from softball, her dad says. "Something I knew she'd just grow out of, just something to do offseason ... until she finally came to me and said, 'Hey, I want to play soccer, not softball.'" Softball's loss was soccer's gain, and the speed with which she has traversed rung after rung -- from raw talent to club star at Orange County's Cypress Elite, her first serious team, to All-America stardom at Cal to a door-opening invitation to train with the U.S. under-20 women's national team, leading to an unforgettable goal, pro acclaim and, now, a role on the sport's biggest stage -- is nearly unprecedented. She has packed 15 years' worth of growth and preparation into six years, her ultimate goal -- to be like Mia, Joy and Julie -- always on the horizon. Even she's surprised how quickly the opportunity arrived. "I don't think I ever doubted myself as a player, but I don't think I really ever looked up at the national team and said, 'I'm going to be there in a year,'" says Morgan, whose game is all flash and power, based on blazing speed, an ability to run at defenders and an uncanny knack for finishing. "That was the goal, and I didn't really have a time frame for that goal. But I knew I wanted to be on this team." Near the end of 2009, a year after her goal cemented the U.S.'s triumph over North Korea in the final at the FIFA U-20 Women's World Cup in Chile, she received an email from former U.S. women's coach Tony DiCicco, her coach with the under-20 team. The message: "Hey, you might get called in." "That was the first time I had a realistic goal," Morgan said. "Before, it was just a hope. And a goal that maybe never would be accomplished, and I never even get the chance. But once I got that email, I really stopped and thought, 'Wow, I can't believe this.' You know?" Alex Morgan made her senior national team debut in March 2010 in the snow at Sandy, Utah, against Mexico. Morgan's first call-up was to a December 2009 camp. She debuted on March 31, 2010, coming on for Rodriguez at halftime of a 1-0 victory over Mexico in Sandy, Utah. Her memory of the game: "It was cold. It was snowing. I was nervous. And it was exciting. But I felt really young. ... I was a little lost." She played again for the U.S. in May, in a 4-0 romp over Germany in Cleveland, then really integrated last fall. She scored her first goal, a superb shot to the left corner in the 83rd minute, in a 1-1 draw with China in Chester, Pa., and tallied in the first two games at CONCACAF's World Cup qualifying tournament in Cancún. The Americans were stunned in the semifinals by Mexico and needed to win a two-game playoff against Italy to qualify. Morgan's 94th-minute goal in the first leg, after coming on in the 86th, gave the Americans a 1-0 lead going into their home leg. That's the kind of work Morgan is expected to do. She has come off the bench in 17 of her 19 appearances for the U.S., all but three of them in the 60th minute or later, with a simple command: score a goal, set up a goal, or help create space for a teammate to score. "As a forward, you have to kind of thrive on that pressure," says Morgan, who scored three more goals in March at the Algarve Cup in Portugal, one to secure victory over Iceland in the title game. "When I get in those moments, and I only have five, 10, 15 minutes to show what I have to contribute, instinct takes over. In the last 10 minutes of the game, you can't really think about the technical side. When you have to score a goal in the last five minutes, you've got to really use your strengths and work with them." Sundhage, a former Swedish star who guided the U.S. to the gold medal at the 2008 Beijing Olympics, is impressed by Morgan's growth and her game. "She is fast, she is open-minded, and her finishing is pretty good," the coach said. "So coming off the bench and just doing the roles and following the tactical things we want her to do, she's done great for that. She improves her game every time she comes in ... gets more comfortable to be with the big girls, so to speak. And she brings out the best performances from the other ones up top [at forward]." Says Abby Wambach, the Americans' top striker: "Alex has come on and really been like a sponge. I see a lot of myself in her, in the way I related with Mia [Hamm when Morgan was the U.S.'s young forward]. It will be an exciting couple years for her to see how she's gone, but she totally deserves all the things that are coming to her." Her father says he thinks it's how she handles pressure. "What's propelled her is every time she's gotten an opportunity, she's come through. Every time," he said. "There's not a lot of difference [among really talented players], it's when they get into situations and have the opportunity to perform, that's when you have to do it. It doesn't matter how good you are. Sometimes you only get a shot or two." Morgan's preparation for her shot didn't begin until she was 15 -- at that age, almost all elite players have devoted at least half of their lives to the game, building skills that enable them to do what normal people can't with a ball at their feet. Before her recent step up to the senior national team, Alex Morgan captained the U.S. to an Under-20 title in Chile in 2008. Morgan, who acknowledges her late start means she's "not as technical as some other girls," was a recreational player with blazing speed, athleticism, enormous heart and a desire to learn, and she was gaining attention from the Olympic Development Program, a foundation of U.S. Soccer's national teams, and college recruiters within a year. "She was always the hardest-working player," said Eduardo Nunes, one of her coaches at Cypress Elite. "You could teach her something and actually see it happen. ... She took every little nugget we gave her and worked so hard at it, and she was really rewarded. "When she first came to try out, we saw that raw talent, saw that raw ability and distinct work ethic. We knew with work she would become a good player. We didn't realize how good. She went from raw talent to being something special." Every piece fell into place. Morgan had first tried one of the big-name super clubs but had a "bad experience" and found Cypress Elite a much better fit. "Every level you get higher, it's a bigger jump," she said. "[Going from] recreational to competitive was a big jump for me. I wasn't ready for that big of a step, and [at Cypress Elite] we grew as a team, and I loved the coaches and really liked how we were Premier [the top tier in club soccer] but our club wasn't a Slammers or a So Cal Blues or a San Diego Surf." She went to the U-20 World Cup as a sophomore, scoring four goals in six games -- her 42nd-minute strike in the final, after beating three North Korean defenders on a thrilling run, was "like nothing I'd ever felt before, the first major thing I'd done in soccer" -- and got that first full national team call up at the end of her junior season. In January, she was, as expected, the No. 1 overall selection in Women's Professional Soccer's draft, going to the expansion Western New York Flash. She lives with her teammates in an Orchard Park, N.Y., complex and has two goals with and assists in six games for the Flash, who have lost just once and sit atop the league standings. Her teammates include Brazilian forward Marta, who has won the last five FIFA World Player of the Year awards, and Canada's Christine Sinclair, one of the game's best finishers, and she expects to learn plenty from them once the World Cup is done. Alex Morgan celebrates a goal against China last October with teammate Kristine Lilly. But first things first. The U.S. has won the last two Olympic gold medals, but it has fallen in the semifinals at the last two Women's World Cups, both won by Germany. The gap between the best and the rest is closing, and several teams are capable of winning the final July 17 in Frankfurt. "Our weaknesses were kind of exposed [when we lost to Mexico in the CONCACAF semifinals], and it kind of let the rest of the world see that we could be beaten. At the same time, that was good for us, because we also know it's not going to come easily. We have to work for this. Every little thing after that loss to Mexico, everything was so much more important, everything was put into perspective. We got a chance to sit down and talk about that, and I think that will help our team in the long run." Morgan will celebrate her birthday against Colombia in Sinsheim, and the Yanks finish play in Group D against Sweden on July 6 in Wolfsburg. Quarterfinals are July 9 and 10, semifinals July 13. Her mom and dad, and perhaps her oldest sister, will be in Germany. Her dad, especially, has traveled the world to see his little girl play. "To be honest, I can hardly believe [this], but, I mean, I do," he said. "Three years ago, I would have never thought this was possible. This is what you dream of." Scott French writes the "Football Futbol Soccer" blog for ESPNLosAngeles.com.